This post was one of my first entries in this blog. I’ve updated it to reflect both changes in my posting style and substantial improvements in available data. Remember when Toyota made a reasonable amount of cool sporty cars? I do—I believe they nailed it with the Mark II Celica Supra. First, the styling: though based on the Celica, the longer hood (to accommodate the Supra’s inline six) along with the pop-up headlights (you’ll have to believe me that they were very cool in the 1980s) substantially changed the look of the car. It wasn’t just the styling—Supras also included a notably higher level of interior equipment. 1982 Toyota Celica Supra, picture courtesy of Motor Trend from their Import Car Of The Year photo shoot. The engine was Toyota’s 145 bhp 5M-GE 2.8 liter/168 ci dual overhead cam fuel injected inline six, giving a 0-60 time of about 9 seconds (spritely for 1982) and a top speed of approximately 125 mph. Over the next few years, engine power would climb to 161 bhp. Mileage with the standard five-speed manual transmission was 21 city/34 highway by the standards of the day (19/31 by today’s standards). Choosing the optional four-speed automatic transmission reduced highway mileage to 32 highway. With a 16.1-gallon gas tank, Supra drivers could expect to drive 360 to 395 miles before seeking more fuel. All Celica Supras included a four-wheel independent suspension, four-wheel disc brakes, cruise control, and a tilt steering wheel. Two models were available: the L– (for “Luxury”) Type and the P– (for “Performance”) Type. The $13,598 L-Type (about $36,700 in 2018 dollars) included standard power windows, power door locks, power mirrors, and P195/70R-14 tires (a size still readily available) on 14 x 5.5-inch wheels. Moving up to the $14,598 P-Type (about $39,400 in today’s dollars) added fender flares, a limited slip differential, eight-way adjustable sport seats, and P225/60HR-14 tires (a size currently available only from BFGoodrich) on 14 x 7 inch aluminum wheels. Here’s a classic commercial, with legendary (and very tall) race car driver Dan Gurney shilling for the brand new Supra. 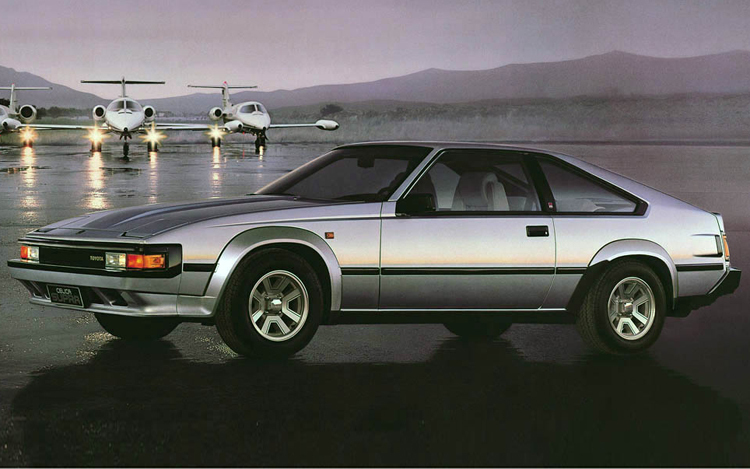 The second-generation Supra was well-received—Car and Driver made it part of their first 10Best in 1983. According to Hagerty’s valuation tools, all the money for a 1982 Toyota Celica Supra in #1/Concours condition is $17,300. The value for a more “normal” #3/Good condition example is $7,200. This generation of Supras maintains some presence in the Hemming’s Motor News classifieds and on eBay Motors—as I update this post in December 2018, there’s Silver 1985 Supra with Gray cloth seats and 109,000 miles for sale in Hemmings asking $12,500. The third generation Celica, especially the black and silver Celica Supra remain one of my my favorite cars of the 80s. Thanks for the comment. Black and silver was a sharp looking color combination on many 1980s cars. Why? Black and silver shot well for B&W print… still the norm back then. The only weakness these cars had was with camshafts. 99% have been fixed, but they were eating lobes off them super fast!!! Most were replaced as TSBs during timing belt/chain services or other major service intervals.